Mercedes say they are determined to extend their performance advantage over the rest of the field despite dominating the start of the season. Lewis Hamilton and Nico Rosberg have won the first four races of the season. with the car proving about a second a lap faster than any rival. 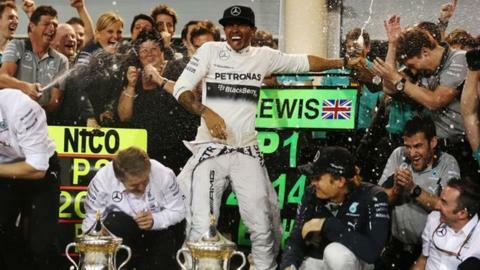 But Mercedes sports boss Toto Wolff said: "Our aim must be to increase the advantage we enjoyed at the last race. "Our rivals are relentless in their efforts to close the gap." Ferrari's Fernando Alonso is Mercedes' closest rival in the drivers' championship. The Spaniard is 38 points behind Rosberg, who leads the championship after a win and three second places behind Hamilton in the four races so far. Hamilton is four points behind the German on account of retiring from the season-opening Australian Grand Prix. Alonso finished third behind Hamilton and Rosberg at the last race in China, but Mercedes' most consistent rivals in terms of qualifying pace have been world champions Red Bull, who have split the Mercedes cars on the grid in three of the four races so far. Wolff, who runs the F1 team in tandem with executive director (technical) Paddy Lowe, said: "It is up to us to rise to the challenge, to take that relentless mentality to an even greater extent than those around us. "If we are to build a sustained level of success in this sport, any small advantage must be seen as a platform upon which to build a bigger advantage." Hamilton has already cautioned that he expects the next race in Spain on 9-11 May to suit the Red Bull car because of the track's demands for good aerodynamics. Good downforce in the sort of high-speed corners that predominate at Barcelona's Circuit de Catalunya is also a strongpoint of Ferrari, for whom home favourite Alonso won in Barcelona last year. Lowe said: "Barcelona is classically seen as the first big milestone for upgrades from the teams and we can expect to see quite a range of developments throughout the pit lane. "The circuit itself is highly demanding on the cars, arguably requiring the best combination of power, handling and aerodynamics seen during the entire season. "It's often said that a car that performs well in Barcelona will be a great car for the season, so we're looking forward to seeing where we stand relative to the competition. "There has been no sense of complacency or backing off just because our car has shown strong performance in the opening few races. The objective is to not only match, but to better the development rate of our rivals and to build on our lead in both championships." Hamilton said: "After three great weekends in Malaysia,Bahrain and China I'm obviously keen to get on to the next one and continue that positive momentum into the next leg of the season. "I've never won in Barcelona but I'm in a good place right now and I'm hoping that this will be the year, although it's clear who the fans' favourite will be."